Fancy breaking your ex’s heart into pieces? 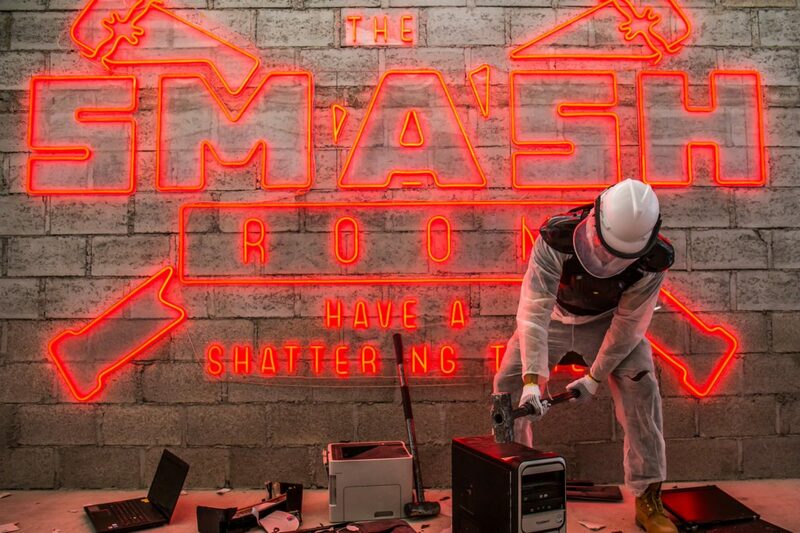 The Smash Room has an Anti-Valentine’s Day package, where you can smash the sh*t out of everything around you including glasses, TVs with your ex’s name on it, and any gifts you may still have from them. Choose your weapon wisely, and enjoy! Single and ready to mingle? Don’t miss the special edition of the epic Saffron brunch on Valentine’s Day to celebrate the single life! Upon entry, each guy will be assigned a lock and each girl a key, after which you must find your match to win exciting prizes. No romance? No problem! Girders Garden is celebrating Valentine’s Day in Dubai with its ‘No Romance Retro Night’. With 5 free drinks for the ladies, 30% off selected drinks for the lads and the best of 80s music playing throughout the night – you know it’s going to be a fun party. Get ready to party hard this V-Day because Barbary and Rémy Martin have teamed up to bring one of the world’s biggest DJs to Dubai! Don’t miss Dimitri from Paris spinning the hottest dance music all night – definitely a great way to celebrate the single life this Valentine’s Day. What could be more romantic than an evening under the stars this Valentine’s Day? Riverland Dubai has a special dinner and cruise offer for couples this V-Day. The evening will kick off with an al fresco dinner, followed by a traditional gondola ride across Riverland. Is you’re significant other a huge film buff? If so, they are going to love this. Roxy Cinemas is bringing back the classic romance flick Notting Hill to cinemas this Valentine’s Day, with an exclusive screening in their Platinum Plus experience. Get the Couples Combo package, which includes tickets, starters, a sharing platter, romantic desserts and mocktails for two. If you’re looking for something more zen, check out the couples spa package at Jiva Spa this Valentine’s Day. The 120-minute treatment includes a traditional aromatherapy massage, followed by a private rose petal bath with a bottle of bubbly. If love is really blind, put it to the test by dining in dark this Valentine’s Day! Up for the challenge? Noire Dubai is hosting a couples-only Valentine’s dining experience in pitch darkness with a 3-course menu and paired beverages. Looking for a fun alternative way to celebrate V-Day? Make your way to JA Hatta Fort Hotel for a mini staycation on Valentine’s weekend, which includes breakfast, dinner, gifts, archery sessions and more!! Surrounded by the stunning Hajar mountains, you might even forget you’re still in Dubai. Up for an adventure? You can go kayaking at Hatta Dam, mountain biking or axe throwing at Hatta Wadi Hub. No matter what you’re relationship status is at the moment, Treehouse Dubai invites everyone down to celebrate Valentine’s Day with them! Upon entry, each person will receive a colour coded wrist band – green if you’re single and ready to mingle, yellow if you’re not sure or just want to hang with friends, and red if you’re taken. Looking for a fun non-romantic way to celebrate Valentine’s Day in Dubai? Get your tickets to RedFest DXB! The music festival kicks off on 14th February, with G-Eazy, Dj Snake and Jess Glynne performing live. Or get a two-day pass to see Camila Cabello, Jax Jones and Macklemore the next day. Ready to make the most out of V-Day? Head to Moe’s on 5th on Valentine’s Day to party it up! There will be complimentary drinks for ladies on arrival, free shooters every 30 minutes for everyone and live music all night.